Includes top/trash can and headpiece. This is an officially licensed Sesame Street Gäó costume. Loveable monsters are reaching soon at your door step so don’t forget to invite them with a warm smile. Enjoy your special moments with Sesame Street funny cartoons. Fun will enter in your bones once you will come out in cute muppets costumes and you will have a joyful time. Men always search for unique and expressive costumes. Start preparing yourself for ultimate experience. 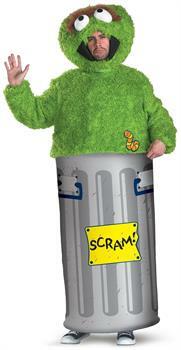 Get the perfect attitude and look in Sesame Street Oscar the Grouch Adult costume.